Try watching a movie with the volume muted, and you’ll quickly realize the importance of the soundtrack – the visuals can really lose their impact without the appropriate music. For most video producers, finding just the right music can be a challenge. There are plenty of royalty-free music collections available, but the songs are never quite the right length, the tempo doesn’t match the action, or the mood is just not right. Sony Creative Software has filled this need for quality custom soundtrack creation with their Cinescore software package. No musical skills are necessary to create great-sounding music to exactly fit your video length and style. 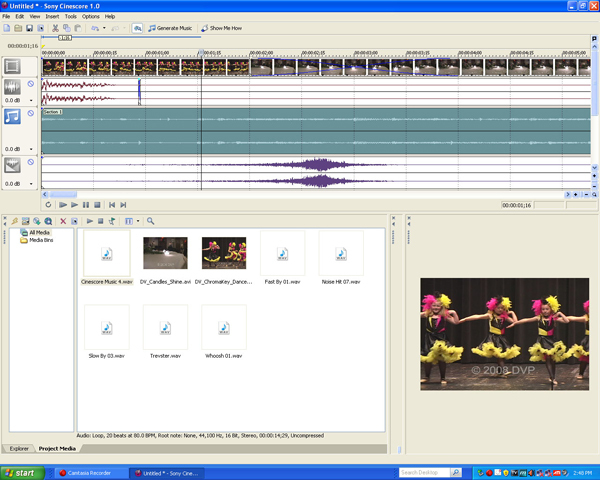 Cinescore operates as a stand-alone PC application, or as a plug-in for Sony Vegas Pro. Cinescore uses a standard timeline layout that most NLE editors will be right at home with. If you use Sony Vegas, then it will look very familiar indeed! There is one video track and 3 audio tracks. The video clip’s audio would typically use one audio track, with the other two reserved for music and transitions, but you can drop any audio clip onto any audio track. Cinescore has the tools to do basic cuts and dissolves on video clips, but in most cases the user will bring a completed video into Cinescore just to add the musical scoring to match the video scenes. As with Sony Vegas, Cinescore will allow you to send video to an external display via Firewire to preview your work. The Cinescore workflow begins by importing your video media, then choosing an existing theme (song) from the included library of 20 themes. Each theme has dozens of variations that can be previewed, each having its own unique flavor. After choosing a theme and a variation, the user can also alter the tempo, mood and intensity as well as the length to match the video. Openings and endings can also be customized. A “loop” ending might be used for a DVD menu or kiosk application, while an “abrupt” ending could be used for a TV or radio commercial. While each theme is basically “infinitely adjustable”, you must first find a theme that suits your needs before any tweaking begins. If none of the included themes fits, Sony offers many additional theme collections, and individual tracks can be previewed at the sonycreativesoftware.com website. While there are currently offerings in several styles including sports, corporate, event and outdoors, I hope that Sony continues to develop and offer new theme packs as well to expand the variety of choices for the end user. 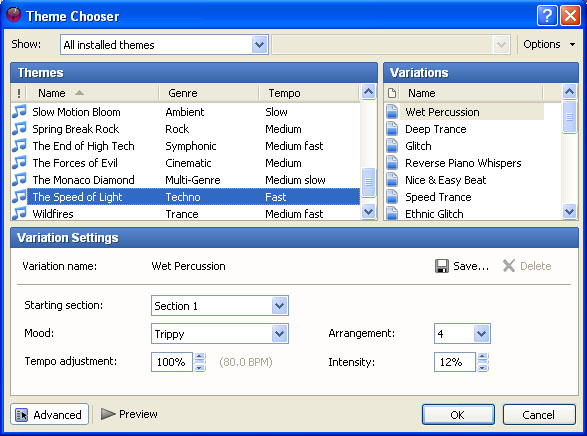 A sampling of sound “transitions” such as swishes, whooshes and hits are included as well. These are not your typical “sound effects”, but rather are very brief little bits that might be used in radio commercials, for example. Besides using the included themes and transitions, you can also import your own songs, audio clips and sound effects in many supported formats for inclusion in the mix. Cinescore can also “rip” tracks direct from CD. Only the special Sony themes can be customized though – your own imported media is simply used as is, with basic trimming, volume and fade controls. The program and included themes come on disc along with (gasp!) a printed manual, which is a rare find these days. Cinescore also has built-in “Show Me How” tutorials that will walk you through the basics of the interface and common operations. After installing the software and spending a few minutes browsing the manual and tutorials, I was rendering out custom soundtracks of my own with ease. I mentioned that video can be placed on the timeline and edited with the music. Once you are happy with your soundtrack, the music can be exported by itself as a .wav or other audio file format, but videos can be exported with the music to many different video formats directly, including .avi, QuickTime, MPEG-2 for DVD, and Windows Media .wmv files. Cinescore is NOT an audio editor or sweetening program – it doesn’t include any audio filters or advanced editing features. It does one thing and does it well, which is creating custom music soundtracks to enhance your video productions. If you’ve struggled with finding the right buy-out tracks to fit your videos as I have, you’ll want to try out the demo version of Cinescore and you may find it an invaluable tool that will save you time and money and improve each project you complete.